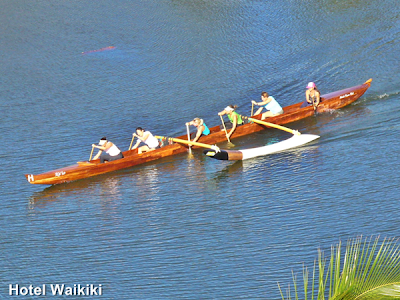 as I already noted in an earlier post, only a single koa wood canoe plies the waters of the Ala Wai. Today da ladies were up in the rotation. The rest of the canoes on the Ala Wai have less prestigious fibre-glass hulls. For practice. You don't necessarily want novice paddlers banging up the sides of a koa wood canoe with their paddles. Also, this past weekend the bank put a hold on my charge card because they detected somebody attempting to make what they perceived as a suspicious use of my charge card to make a purchase in Washington State. I forget why but it was apparently an online purchase, so the buyer could be anywhere else from Nigeria to the next apartment building from me. I talked to the bank's security department, and we agreed it's best to cancel the charge card and for them to issue me a new card with a new number. PIN stays the same, whew. The suspect purchase only amounted to $15 and some odd cents, so it might have been a test run for larger purchases if the thief saw that the bank hadn't flagged it. Also, AOL disabled my access because they weren't able to get paid with the hold the bank put on my charge card. I was a little urinated pee-ed. How do you spell that word. Don't AOL know that these things can and do happen to credit card holders time to time? "Valued member since 2004" .... my okole. Actually, longer than that when I kept a different earlier account with AOL. At any rate, while I was checking things out on the My AOL page, I realized they're been charging me $11.95/month instead of the usual $9.95/month. How did that happen? At one time I actually was paying $11.95 until I saw somewhere that I could subscribe a $9.95 and receive about the same level of service. I only use AOL for Email. Rarely for anything else. For that matter, AOL offers free Email accounts sponsored by advertisements. Back then, I down graded my level of service at AOL to $9.95 from $11.95. Somehow it's back up to $11.95 again, all by its mysterious self. You have an EXCELLENT bank to pick that up! Wonderful! How scary though. Shame on AOL. I'll try to remember not to use them. Kay- I suspect that AOL sent me one of those emails that if you didn't send it back, it meant that you affirmed the increase. That's one nice looking canoe! Nate- I wonder who gets to polish and shine the canoe. Fibre glass canoes they probably just hose it off with fresh water.